Claudius the Roman Emperor orders the invasion of what is now southern England. However, while there may have been some military excursions into what is now Scotland, it is not until later that significant incursions into the South of Scotland are recorded. Agricola, the Roman Imperial Governor of Southern England, attacked southern Scotland and advanced as far north as the River Tay. Before the Romans could exploit their victory a harsh winter came. Agricola was recalled to Rome due to unrest in the city and the Roman legions withdrew south to secure territory to the south of a line that was later to be fortified and known as Hadrian’s Wall. Over the next 3 years his army strengthened their grip on what they called Caledonia culminating in the defeat of a massive army of three Celtic tribes unified under Calgacus at the Battle of Mons Graupius (thought to be near the hill called Bennachie, Huntly, Aberdeenshire). Calgacus, translating as “the Swordsman”, was most likely a Pict and is the first ever resident (real or fictitious is not known) to be quoted anywhere, with Tacitus recording his stirring words to his troops. However it is not unknown for Romans to embellish their opponents numbers and deeds to make the victory all the more noteworthy back in Rome. Governor Pompeius Falco began work on Hadrians Wall: the work took several years to finish and when completed the wall stretched over seventy miles from the Solway Firth in the west to Wallsend near Newcastle in the east. Romans led by Governor Lollius Urbicus return to Scotland and commence building Antonines Wall, which spanned the narrow isthmus between the Rivers Forth and Clyde. Roman troops abandon Antonines Wall following repeated fierce attacks by the Celtic tribes, whom the Romans gave the collective name ‘pictii’ because of their painted faces and bodies. Today this collective are known as the Picts. Emperor Constantine the first makes Christianity the official religion of the Roman Empire. The Roman garrison finally leaves its province Britannia undefended. The Scots of Dalriada start to settle in Argyll and the Lennox area around Loch Lomond and establish settlements in Kintyre, Lorn, Islay and Jura under their Chieftain Fergus Mor. The Angles land in Northern England for the first time. Romano-British leader Ambrosius Aurelianus (possibly later to be known as King Arthur according to the History of Britons written in Latin by the chronicler Nennius) and his army defeat the Angles at Badon Hill. The Battle of Dunnichen Moss, also known as Nechtansmere in the Sidlaw Hills near Forfar. Probably the most important date in the formation of Scotland because for the first time a confederation of Scots and Picts, led by the Pict, Bridei mac Bile, unite to inflict a momentous victory over the almost invincible Angles of Northumbria. This victory coupled with the growing strength of the Vikings of York meant the Angles could no longer support the territory gained by repeated military campaigns and their land occupation began retracting to their home patch of Northumbria. 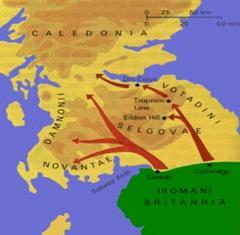 The Vikings, who had increasingly been viewing Scotland with predatory intentions, laid waste the Lothians and Borders. Rallying behind Columbas sacred banner, the Scots fought back and beat the Vikings the next year. 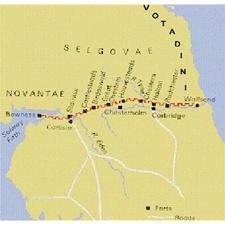 In 914 the Scots were defeated at Corbridge in Northumbria by the the Viking Ragnall of York. However Scotlands King Constantine II returned to Corbridge in 918, this time defeating Ragnall. The Battle of Carham, Northumbria was fought because the Angles of Northumbria wanted to reassert their grip on the Lothians and the Eastern Borders. King Malcolm II of Scotland defeated Edwulf and his Northumbrians. Although the casualties are unknown, it is known that at least 18 Northumbrian clergy plus a fair score of Northumbrian nobility perished in the battle. The consequence of the battle was a border line was finally drawn between the Scots and the Northumbrians and that line on the east side of Britain was the natural barrier of the River Tweed. King Macbeth for the first time on Scottish soil utilises the talents of Norman warrior mercenaries in his various military campaigns. Cospatrick (or Gospatrick) , the Earl of Northumberland, and several other Angle nobles connected with other northern counties supported the inauguration of a viking king on the throne at York. William the Conqueror marched north and defeated this insurrection. Cospatrick fled to Scotland carrying with him Edgar Atheling, the heir to the Anglo Saxon line and his two sisters Margaret and Christina. Malcolm III (Canmore), King of Scotland, 1057-1093, married Margaret and bestowed on the expatriate noble the manor of Dunbar, the broad lands in the Merse (located in the Eastern Borders) and the Lothians. A couple of generations and a marriage dowry of the lands of Hume (also located in the Eastern Borders) later, and the family adopted the name of the dowry lands and the family Hume appears. This name was to appear repeatedly in the annuls of Ayton history over the next 800 years.